At any one time, there are several plant experiments going on hereabouts--various grafts, rooting, germinating seeds, stress tests and such. 1. Does it look wrinkled but is otherwise firm and dry? If so, the adenium plant is in need of water. It has started using up the moisture it has accumulated in its caudex. In the warm season, water it vigorously (obviously do not soak). In the winter, just give it a sip--I define this to be about two tablespoons of water. Your objective is to prevent the plant from desiccating without jolting it out of its winter stupor. 2. Does it look wrinkled, squishy and wet? This can be many things. Other than frost damage like the one above, it could be root rot crawling up to the exposed caudex. Root rot is almost always caused by over-watering which encourages opportunist critters to take over the plant. It is also possible that insects can cause this kind of damage as well, just by sheer proliferation in the potting material. There is no solution I have learned so far that would not involve radical amputation of some sort. 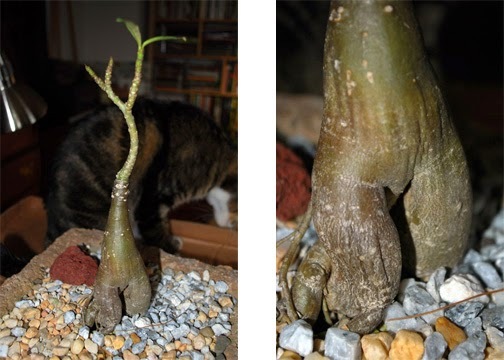 In the case of this plant, sold as Jawphaya, it had to be cut so radically that it lost the entire swell of its caudex. 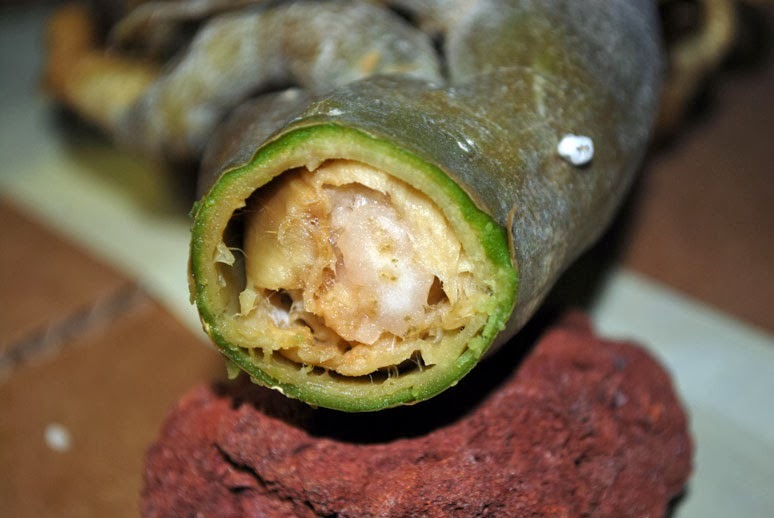 When the entire lower half of the plant was cut, it was clear the cut was not high enough to expose only the remaining healthy portion of the plant. It had to be cut another inch. Get a sharp cutting tool (a box cutter, say), wipe it down with alcohol to avoid aggravating your problems later. Wear gloves before you cut the plant--some people are sensitive to the secretions of this plant. See that you cut far enough from the damaged portion so that the exposed part of your plant will show only healthy tissue. Otherwise, the remaining unhealthy bits would encourage rot later. You can wait anywhere from a couple of hours to a whole day to dry the amputated plant. After that, dip the cut in one of those root products before potting it up in very loose and dry potting material. Let the plant stay that way overnight and water it slightly the following day. Just a couple of tablespoons would do. If you soak it, it will rot. Depending on how much you want to spoil this ooops victim, you can just make sure it is in the sunniest, warmest spot in your house in the winter or in a warm, bright shade in the summer. You can not leave it alone, mind. Check often to see how it is doing--just don't do anything daft like watering it everyday. Then find your cat and cross its paws. 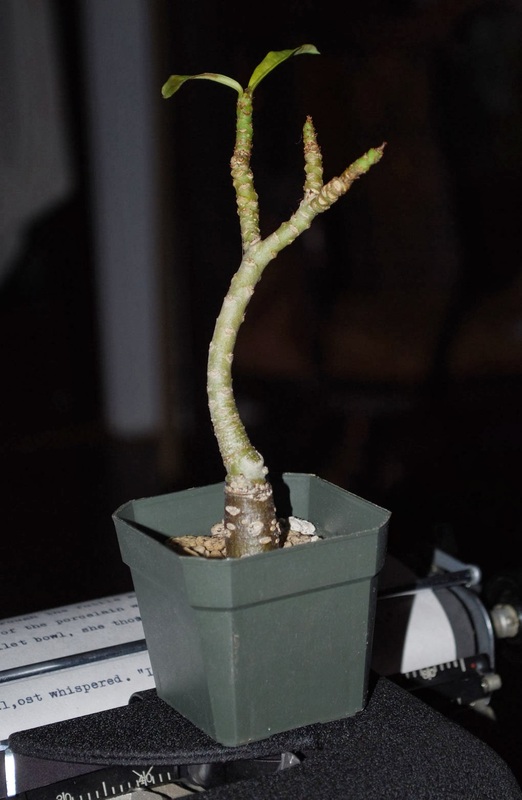 The cutting stayed in this pot for a two to three weeks before it started to completely die. Looking back, what should have been done was to graft pieces of it on to other more mature, more vigorous plant stocks if only to preserve the Jawphaya variety. Even in the winter it would have been the better option to trying to root such a cutting from such a weak plant to start with.